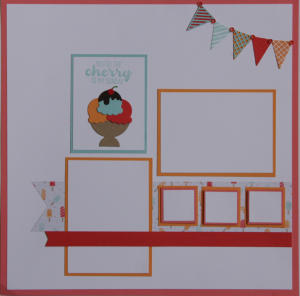 Class today…lots of fun stampers and of course, stinkin’ cute cards. This morning Ms. Barb and I joked that it wasn’t the usual Coffee and Cards but more like, Chaos and Cards. I was dragging a little from the expo and a weekend of soccer which equates to “not really ready” and about 1 hour before class it hit me that we had already MADE one of the cards LAST month at class…talk about a pit in your stomach! I quickly grabbed a swap card, changed it up and cut cardstock speedy quick…which made for chaos. Two of my favorite stampers usually arrive about 45 minutes early and today, I was barely out of my jammies and was rushing around throwing stamps in a bucket. Chaos indeed…and all for naught. When I showed the stampers the card in questions…they all said, “nope…havent’ done that card.” Apparently, we had made it at our GROUP meeting and not in class. I need more coffee…or a brain…Either would be nice. So all’s quiet now…and I need to share a layout with you from my list of things to post. Here’s a layout that we did back in Feb at my Layouts Class. It’s a cute one for sure. Layout class is on Thursday this week. Hope you can come. Enjoy…remember…Layouts Class – Thursday, April 27th. I occasionally have extra packets available after class if you aren’t able to attend in person! Contact me..